Edinburgh 1 retained the Edinburgh League Premier League title this season. Our final tally of 6 wins, 3 draws and 1 defeat illustrates that this season the league was very competitive, with all teams capable of taking points off each other. Congratulations to the squad of Neil Berry, Hugh Brechin, Andrew Green, Paul Roberts, Graeme Kafka, Petros Wallden, David Sime, Calum MacQueen, Willie Rutherford and Andre Antunes! On Tuesday 19th March Candidate Master Andrew Green gave a talk to the club members. Andrew works as a full time chess coach, and has lots of experience in coaching many Scottish junior internationalists. This position comes from 2 computer games, Stockfish against Google’s Alpha Zero, famous for getting its strength from purely playing against itself millions of times. 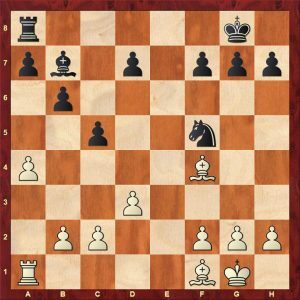 Alpha Zero has “taught” itself Capablanca’s rule, and was able to restrict the dark squared bishop by 1…f6! 2.c3 g5! 3.Bd2 a5!, and Black is fine. Today was the last match of the SNCL. The first team had a slim chance of the title, but we had to defeat the leaders Dundee City A and hope other results went our way. Unfortunately a strong Dundee team defeated us 4.5-0.5 to retain the title. The second team needed to win to secure a top two finish and promotion from division 3. This we did with a 3-2 victory, congratulations to the team! Thanks to everyone who played this season. An excellent result! Thanks to Keith Rose of Castehill for hosting us. The other semi final between Edinburgh West and Phones takes place next Saturday (at the club!). Final is provisionally on Sunday April 14th. Good results all round for both teams in day 3 of the SNCL in Dunfermline. The 1st Team beat Hamilton and Stepps Warriors, both with a 3-2 scoreline. The 2nd Team recorded wins against Pentland Hills (3-2) and Oban 4-1. Both Teams lie 3rd with 1 round to play. The 2nd Team have some chance of promotion to Division 2. They need to beat Musselburgh and hope that CSBOS can win against East Kilbride. The SNCL Organising Team, led by GLynis Grant, announced that next season will be their final one in charge. They have run the SNCL for a number of years (decades? ), and the league is as strong and well supported as I can remember. 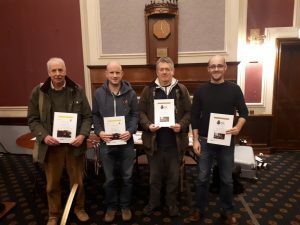 We entered 2 Teams in the Edinburgh 2020 Team Rapid event at Edinburgh University Teviot Hall on Saturday. The 1st Team came first on tiebreak from Glasgow University, with a strong Strathclyde University Team in 3rd. Individual scores (5 games): Neil Berry 3.5, Alastair White 2.5, Willie Rutherford 4, Andre Antunes 5. Both Willie and Andre won individual board prizes too. A critical moment in our 2-2 draw with Edinburgh University. 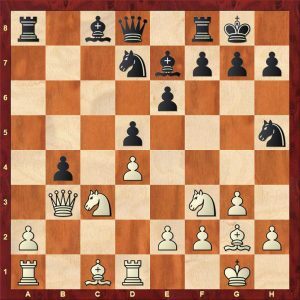 After 1.Na4?, my queenside initiative developed smoothly with …Qa5, …Ba6, …Rfc8, …Nf6-e4v and so on. Fortunately my opponent missed the shot 1.Nxd5!, when after 1…exd5 2.Qxd5 White exploits my lack of coordination to regain the material with interest.